Mystic C - It is believed that J. St. Clair Mendenhall developed and implemented this honor camping society at early Kansas City, Missouri Council Summer Camps in the early teens. Mendenhall was the 63rd Eagle Scout in the country, having received his award in 1913. It appears that he was an adult Scouter at this time because records show that he was appointed the second secretary of the fledgling Council in 1912 and served until he left for Toledo in late 1914. It is believed that there were several requirements for the Mystic C - including participating in campfire programs, participation in athletic and good turn programs and general good behavior. It is not known whether a patch or ribbon system was used in the teens. 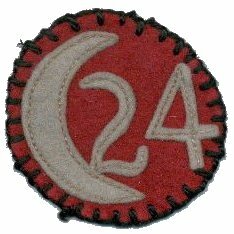 At Camp Dan Sayre in the 20's, special camp patches were distributed to those who became members of this camp society with the year and a large "C" on them. The Order of Chingagook was another Honor Camping Society at Camp Dan Sayre in the 1920's. The Requirement Sheet for the Order of Chingagook states that candidate must have earned their Mystic C prior to working on their Order of Chingagook Honor Belt.